Three hours after the Vermont legislature reelected him, Gov. 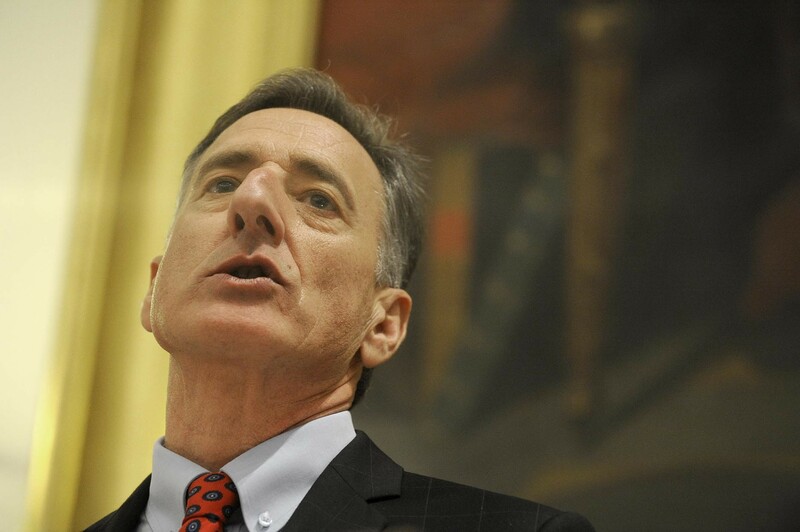 Peter Shumlin told them Thursday he got the message that voters were upset. “I heard clearly in the election this fall that Vermonters expect more from me and from the state to improve their lives,” Shumlin said during his third inaugural address. Whether he can prove it remains to be seen. Shumlin said details of his plans to address the state's $100 million budget gap, along with rising education and health care costs, won’t come out until next week’s budget address. Instead, he focused much of his inaugural on energy and environmental issues. That led Republicans and Progressives to say after the speech that Shumlin had not received the message voters sent. Activists repeatedly interrupted the proceedings, twice hauling out banners and chanting through key moments of the inauguration to protest Shumlin’s decision last month to abandon plans for a government-financed universal health care system. “We’ve come too far. We won’t go back,” several hundred protesters chanted in the Statehouse hallways as staff, legislators and finally the governor made their way to the House chamber. To get to Thursday’s inaugural, Shumlin squeaked through a surprisingly close November election by just 2,434 votes, with a less-than-50 percent majority that sent the election to the legislature. Shumlin won legislators’ support — and reelection — in a 110-69 vote Thursday morning over Republican Scott Milne. Many listened to Shumlin’s 45-minute speech for signs of political life. Shumlin's focus on energy and the environment may have offered some such signs to core supporters. He pledged to infuse money into cleaning up Lake Champlain and to boost renewable energy opportunities. “This seems to me a positive signal,” said Chris Kilian, Vermont director of the Conservation Law Foundation. He said he thought the lake's condition, not last fall’s election, prompted Shumlin to turn his attention to water quality. "I think it's because Lake Carmi and Lake Champlain were in such dire and foul condition this past summer. We knew this was going to be a major political initiative for months,” Kilian said. But Shumlin’s decision to avoid discussing the state’s other pressing challenges until next week’s budget address disappointed some lawmakers in attendance. "I voted for Peter Shumlin today, but I'm disappointed in his speech," said Rep. Kurt Wright (R-Burlington). "The idea that he gave total lip service to property taxes — I don't think he got the message." Rep. Susan Hatch Davis (P-Washington) said she agreed with what was included in the speech but worried about what wasn’t. "I don't think I heard a lot for people struggling to pay their electric bills," she said. House Speaker Shap Smith (D-Morristown) disagreed. Voters made clear they were concerned about Lake Champlain, he said, and Shumlin's energy proposals would help create the jobs and economic boost voters said they wanted. "It makes sense to focus where the stronger parts of our economy are," Smith said. Shumlin said the rest of his plans would come next week, when he outlines what he described as “the hardest budget I’ve had to create.” In that speech, he said, he will address workforce development, education quality and spending, health care, child protection, and drug abuse. Shumlin was accompanied to the chamber by his brother, Jeff, his daughters Olivia and Rebecca, and in her first formal public appearance, his girlfriend, Katie Hunt. In his address, the governor championed Vermont as a home to innovative renewable energy. He highlighted the Borkowski family of Rutland, who play host to Green Mountain Power’s first so-called "eHome," which virtually eliminates their need for heating oil and has cut their electric use in half. “The Borkowskis remind us that our small, rural state has all the ingredients needed to claim the mantle of the nation’s energy innovation leader,” Shumlin said. Changes to Vermont laws in recent years allowed for the creation of more than 15,000 jobs in the clean energy sector, he said. Shumlin pledged an Energy Innovation Program as a “bold” step to boost that sector more, while saving Vermonters money on energy and cutting greenhouse-gas emissions. The program would offer incentives for renewable energy projects. Shumlin promised increased enforcement against those who violate water-quality regulations. Farms that fail to comply with regulations will lose property tax reduction benefits, he said. He also pledged more money to help farms, communities and businesses comply, with $6.75 million for technical assistance in water-quality projects, $3.75 million for stormwater management projects, $1.4 million for agricultural measures and $3.2 million for road runoff mitigation. He also said he would raise $5 million more for the Vermont Clean Water Fund by charging a fee on farm fertilizers and enacting an impact fee of $100 to $200 on commercial parcels in the lake watershed. He said he would not seek a fee on private home parcels. Shumlin said Keurig Green Mountain, based in Waterbury, will contribute $5 million over five years to the fund. Rep. Heidi Scheuermann (R-Stowe) said the governor’s focus on Lake Champlain was warranted but argued that proposing two new taxes was an indication that Shumlin had not heard voters' concerns.